SORBOTHANE is an artificial muscle designed for medical purpose and was originally invented in the UK. The incredible shock absorption and pressure dispersion performance is highly recognized in the medical field. Recently its use has expanded widely from medical to industrial purpose. It has the incredible shock absorption and pressure dispersion performance SORBOTHANE is a material of high performance and is suitable for medical purpose. Foot problem may lead to pain in other parts of the body. The pain is like a signal that indicates the malfunction in our body. At medical sites where treatment of foot disability takes place, SORBOTHANE has become one of the frequently used materials to ease the pain in the foot. 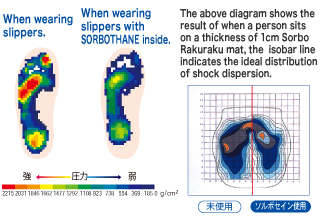 Moreover, in our daily life or in sports activities, SORBOTHANE insole products may reduce pressure of rear foot strike (heel strike) and effective for anti-fatigue. It has been proven to be useful for injury prevention and improvement of exercise performance. SORBOTHANE is a visco-elastic polymer. When there is pressure, SORBOTHANE quickly changes its shape and absorbs the pressure by slowly recovering its original form. It also keeps your feet comfortable by dispersing the pressure evenly with high viscosity and elasticity. SORBOTHANE, compared to materials such as rubber and EVA, shows better performance in restoration (recovering the original form) and durability. 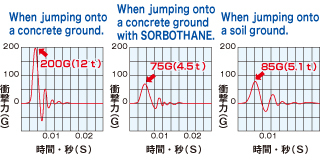 When jumping on to a concrete ground using SORBOTHANE, it will reduce the shock nearly to the level when jumping on to the soil ground without using SORBOTHANE. The above data is the result of the case when a person whose weight is 60kg used a 7mm thick SORBOTHANE in his heel and jumped from the height of 30cm above surface. Effective in dispersion performance. It prevents the shock from concentrating on a certain part of your sole. Absorbs shock impact in all kinds of directions. Intense exercise which involves frequent “stop – dash” causes impact to your feet, knees, waist which may result in physical disability. Especially when the impact involves a twist and the movement continues to occur for a long time, it is likely that the disability will come to the foot, knee, waist and eventually the upper limb. Since SORBOTHANE can reduce the pressure and can absorb the impact of all kinds of direction and twist movement, it is suitable for medical purpose and is used in various products. SORBOTHANE provides maximum durability. SORBOTHANE has high performance in restoration and provides long term durability. When using a shock absorption material such as sponge, the impact tends to concentrate on a certain part of the foot. On the other hand, SORBOTHANE disperses the pressure and brings the comfort to the foot. The movement in the arch alignment of the sole helps to maintain the foot position. Anti-bacterial material keeps your foot sanitary. SORBOTHANE has extraordinary antibiosis. It is effective in preventing the bacteria from increasing. This explains the excellent antibiotic capability of SORBOTHANE.